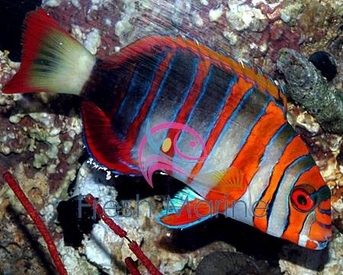 https://sep.yimg.com/ay/yhst-33477391359232/harlequin-tusk-wrasse-lienardella-fasciata-tusk-harlequinalia-tuskfish-9.jpgHarlequin Tusk Wrasse - Lienardella fasciata - Tusk Harlequinalia - Tuskfish ModerateSemi-aggressive55 Gallon9.8 inchesYes, with CautionCarnivore, Pellet, MeatyAustralianLabridaeSmall 1" - 2"
The Harlequin Tusk Wrasse is the most popular and ideal choice for the bold community aquarium. Their teeth would be protruding enough to give that fierce feature as if it�s a dangerous species. The Harlequin Tusk Wrasse has thin blue horizontal lines over its head. Harlequin Tusk Fish have wide bright vertical orange-red bands over their heads. These bands alternate with white bands. The Harlequin Tusk Wrasse has a yellow tail and the rear areas of their bodies are purple to dark blue in shade. They have black speckles when they are young. The Harlequin Tusk Wrasse is very sociable and it will sleep on the bottom of the aquarium in a sheltered rocky area. The Harlequin Tusk Wrasse is not reef safe as they will eat any invertebrate. General Size Specifications: The small size will come to you generally in the range of 1 to 2 inches; the medium in the range of 3 to 4 inches and the large in the range of 5 to 6 inches. Minimum Tank Size: A single Harlequin Tusk Wrasse should have an aquarium of at least 75 gallons in size. Temperatures between 75 and 80 degrees (24 to 27 degrees Celsius) are appropriate, with a pH of 8.3 to 8.4. Specific gravities should remain between 1.020 and 1.025 in a fish-only aquarium. Feeding and Diet: The Harlequin Tusk Wrasse should be fed diets of crustaceans, shellfish, and fish. Frozen items are also acceptable.